Last summer when RIM announced that the release of BlackBerry 10 was going to be pushed back to early 2013, a lot was made of the fact that RIM was going to miss the Christmas season. Yet, I fail to see why this would be a big deal. Yes, the three month delay will hurt BlackBerry, but the fact that the three months happen to include Christmas is largely irrelevant. The set back is not more significant than any other three month period would have been. The reason for this is that BlackBerrys have never been all that popular as Christmas gifts. 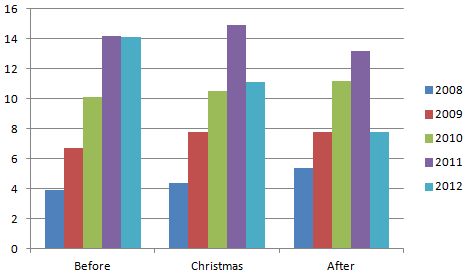 Last year, I looked at the myth of the Christmas day sales spike and found that app downloads and sales on the days surrounding Christmas were no different than any other days that month. Intuitively this makes sense as most people are unlikely to give a gift that also requires a two-year contract. In fact I think it is safe to assume that most of the mobile devices given as gifts this year will be wi-fi only devices, or pre-paid phones. BlackBerry 10 would not be making much of an impact on the pre-paid market either way, as the new devices would be priced a bit out of this market for the first few months anyhow. Furthermore, RIM has never seen a spike in sales in the quarter that contains Christmas. The following chart shows the number of BlackBerry phones (excluding PlayBooks) that RIM has sold for the past five years in the quarter containing Christmas, the quarter before Christmas, and the quarter after Christmas. Of these five years, only in one of them did the Christmas quarter result in more devices shipped then both of the quarters surrounding it. In short, while pushing back the release of BlackBerry 10 isn’t good news, the fact that BlackBerry 10 was pushed to the other side of Christmas is not that big of a deal.